This week went by in a blur. The tot started going (one day a week) to a preschool all on her own – and she’s in love. I spent the first half of the week freaking out over actually leaving her (for the first time ever) with someone other than her Opa and Gamma. Yes, we’ve managed to get this far without babysitters, and, admittedly, are going a bit bonkers. So, when her first day went so successfully, the husband and I started breathing a bit easier – and realized it was time for our tot to spread her wings and fly a bit more (and now I have the song in my head – super cheese, but go listen if you want). Fridays are the tot and I’s day off. We lounge about, head outdoors, do a few art activities, and try new recipes. This morning we kept things simple and focused on learning more about color and shape recognition with circles. This is a great toddler activity that also encourages organizing (cleaning!) as well as language and math skills. I gave the tot the big assignment of searching through all her toys for things in the shape of circles while putting all other things away. While I watched in amazement, I got out a couple of sheets of paper and our red, yellow, and blue tempera paint. Once she had a collection of circular items, we went through them discussing if they had any sides while comparing them with other shaped objects. We determined that squares have four sides, triangles have three, and circles look just like the letter “O.” I also added a few circle items to her mix such as a sliced lemon and a wine cork. 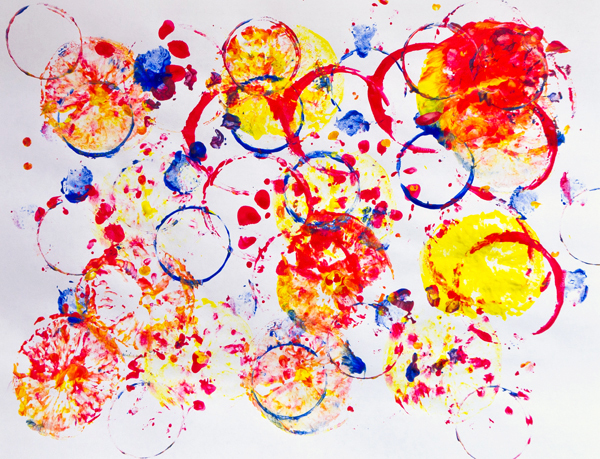 I let her loose to press the circle stuff into the paint and then stamp, stamp, stamp on her paper. If your tot gets frustrated with her paper moving all about while creating, tape the edges so things stay in place. Make sure to have lots of extra sheets of paper on hand to edit while creating. I often switch out papers once things start mixing together into a big brown mess. And, low and behold, while I was finishing the tot’s “organizing” she yelled out, “geeeen!” Sure enough, that color-theory lecture payed off! 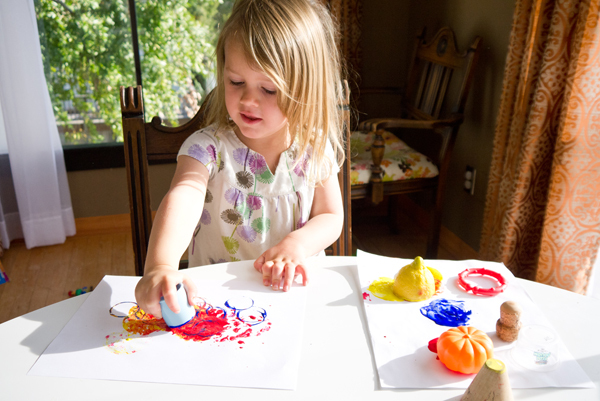 Once the simply circles creations are dry, invite your tot to select her favorite and proudly display it on the fridge. Don’t have lots of circle stuff around the house? Do the activity with squares, or triangles, or rectangles. Or, make things even more interesting by assigning each shape a color (for example: triangles go in the red paint) and see if your toddler can follow the colorful directions!